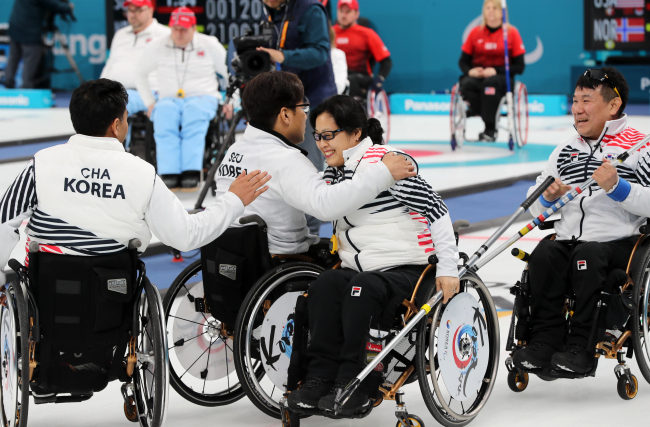 GANGNEUNG, Gangwon Province -- South Korea has reached the semifinals of the wheelchair curling competition at the PyeongChang Winter Paralympics on Thursday. The team of Seo Soon-seok, Bang Min-ja, Cha Jae-goan, Jung Seung-won and Lee Dong-ha beat Britain 5-4 in their 10th qualifying match at the PyeongChang Paralympics. South Korea now has eight wins and two losses to put it in second place alongside Canada, with only one match remaining in the qualifying round. South Korea will face China in its final qualifying match later Thursday at Gangneung Curling Centre in Gangneung, Gangwon Province. China, currently the leader in the qualifying stage, already confirmed its semifinals berth Wednesday.